Before it was the MARVEL SUPER HEROES SECRET WARS it was COSMIC CHAMPIONS! This news page from Marvel's in-house plugzine MARVEL AGE MAGAZINE shows how late in the day, at the behest of toy manufacturer Mattel, Marvel switched titles for Jim Shooter's sprawling (some might say rambling, although I think that's a comment better suited to the ramshackle sequel) twelve-issue game-changer. 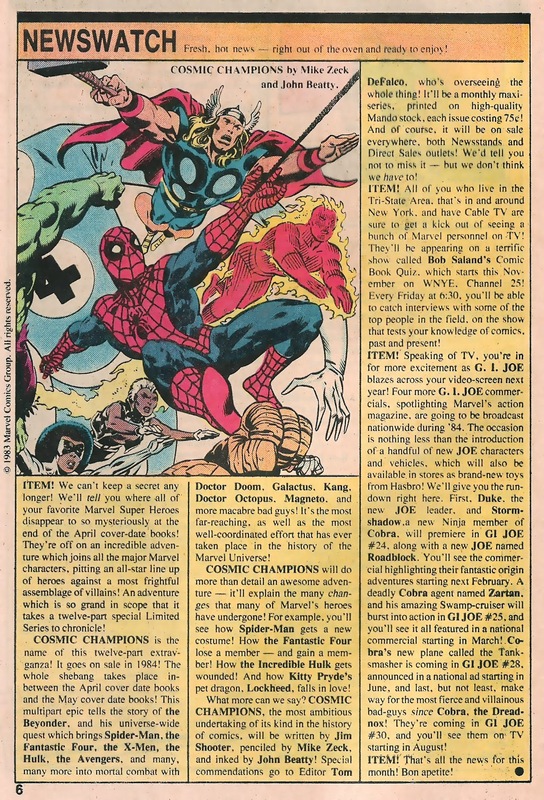 This page comes from MARVEL AGE issue 8, cover-dated February 1984.